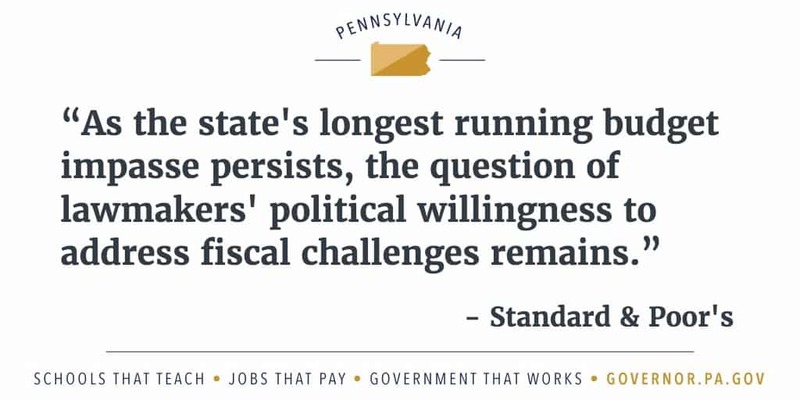 CHICAGO (Standard & Poor’s) Dec. 29, 2015 — Despite six months of deliberations, Pennsylvania’s budget deliberations continue, leaving it uncertain whether legislators will act to close the state’s budget gap or address its long-term pension liabilities. Our AA-/Stable general obligation (GO) rating on the Pennsylvania is still unchanged despite the political gridlock because of the state’s demonstrated willingness to honor its debt obligations. We are also waiting to see how further deliberations play out as legislators have still to determine a revenue package for fiscal 2016. On Dec. 29, 2015, Gov. Tom Wolf announced that he would line-item veto the legislature’s budget while providing emergency funding to public schools and social service providers. The $30.3 billion budget passed by both the house and senate is, in our view, structurally unbalanced and does not include pension reforms negotiated in the previously agreed-upon budget framework. As proposed, the budget had a $500 million budget gap for fiscal 2016 and left a $2 billion budget gap for fiscal 2017. While we have previously stated that we could consider a negative rating action or outlook if the state fails to address its budgetary imbalance or reverses course on addressing its pension liabilities, we are waiting for further developments on a corresponding revenue package and to better understand whether a pension reform will be part of a final budget. The release of emergency aid to schools will help relieve Pennsylvania schools’ cash flow pressures, but we have not reinstated our rating on the Pennsylvania state credit enhancement program because we still consider state aid payments to be unreliable given the state’s chronic failure to pass an on-time budget (see “Standard & Poor’s Analysis Of Credit Enhancement Programs Is More Than A Mechanical Exercise,” published Dec. 14, 2015). We previously viewed the hold-up of state funding as motivation for lawmakers to pass a budget. The emergency school funding measures gives more time for the budget deliberations to continue. As the state’s longest running budget impasse persists, the question of lawmakers’ political willingness to address fiscal challenges remains. Past protracted debates have not always resulted in balanced budgets. A lack of reforms in the current budget year could add to the growing revenue and expenditure misalignment and increased pension funding pressures in fiscal 2017. For the next fiscal year, the governor has discussed a personal income tax increase, coupled with a new severance tax, which were rejected by legislators this fall. It is possible that future revenue enhancements and pension reforms could face politically contentious negotiations yet again given that both sides were far apart on the issues not addressed in the current budget. While we have not changed our rating based on the state’s political gridlock, continued structural imbalance or lack of progress in funding its pensions could result in a rating action. We have determined, based solely on the developments described herein, that no rating actions are currently warranted. Only a rating committee may determine a rating action and, as these developments were not viewed as material to the ratings, neither they nor this report were reviewed by a rating committee.